Let’s be honest: data-visualisation is probably not the most enjoyable part of your job. There’s no doubt that you’ve already experienced long sessions of KPI reporting with a complicated and stressful tool. That’s exactly why DashThis is now your new best friend: to give you stress-free KPI reporting. Here are the ABCs of an easy-to-make KPI report. Select the platforms you want to link your dashboard to, enter your credentials, and say hi to a new life... one in which connecting all your integrations is a matter of only a couple of minutes! 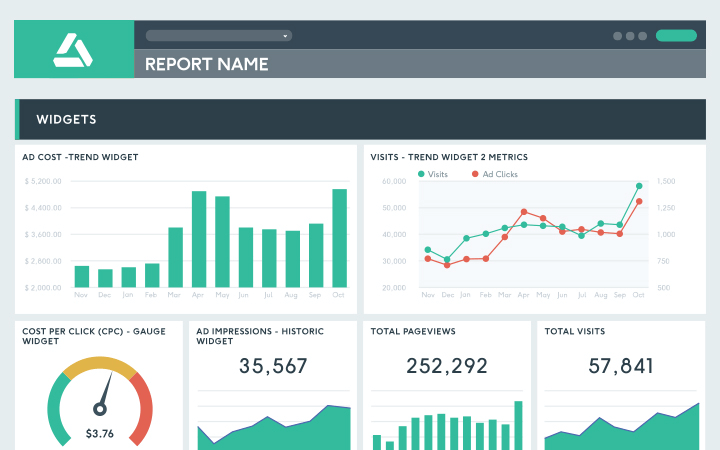 In a few clicks, you’ll be able to assemble all your marketing data in your new KPI report! Make it yours by displaying your data the way you want to. With all of our available metrics, dimensions, and widgets, you’ll be able to create the KPI report you’ve always dreamed of. Don’t want to take time to set up a custom dashboard? That’s all right, just select one of our preset templates! Share your dashboard with the right people by inviting them to view your work and automate your report distribution by creating mailing lists and setting your dispatch frequency. We take care of the rest! A great KPI report includes data from various platforms. Good news! We support major web-based tools such as Google Analytics, Google AdWords, Facebook, Twitter, MailChimp, and many more. You can also import custom data directly from your CSV files and automate the process so that you don’t have to import it all over again on a monthly basis. When your clients receive a good-looking KPI report that includes all the information they need, they aren’t going to believe that it was so easy for you to create. Better yet, you’ll always be accompanied by our awesome customer support, no matter if and when you have a question or just need a little reporting-insight. At DashThis, people come for the tool and stay for the people. Don’t believe us? Check out a couple of our happy clients! From preset templates to full customization, campaign KPI reports to rolling KPI reports, the features that make DashThis so appreciated are plentiful. Bottom line, all our features are there to make your life easier. And don’t forget: you get your own dedicated account manager as soon as you start your free trial, and that manager stays with you forever, no matter the plan you choose! Take 2 minutes to think about how much time you spent over the last few months on your KPI reports. Probably too much, right? DashThis is more than a monthly fee. It’s an investment in the long run (considering the time you save!). Trade the default DashThis URL for one that reflects your brand, such as reports.yourcompany.com. Want a fully custom KPI report report that looks like your brand? Our designers would be happy to create one for you! Save on a custom URL and design with a white label bundle that includes both! A KPI report just the way you want! Traffic, Time on Site, CTR, Conversion Path, Bounce Rate… Your clients’ websites undoubtedly involve a whole lot of data you need to constantly keep track of. With a Google Analytics report template, gather all your clients’ website data in a single, nice-looking Google Analytics report for your client and start reporting in no time! Our blog is full of KPI reporting content! Want to get the most out of our KPI reporting tool? That’s what our blog is for! And if you want to get content right in your inbox, sign up for our newsletter. We won’t spam you, we promise! Join the Club… We Saved You a Seat! DashThis is the power behind thousands of monthly online marketing reports. Still wondering if we’re really THAT cool? These folks seem to think so! Easy, convenient, and fast to set up. The biggest benefit is the time saved in terms of data collection. It's also great that the design is very pretty out of the box. We've played around with countless reporting tools over the years but none of them come anywhere close to Dashthis. The level of integration and customization of reports, as well as their outstanding client support are unrivalled! DashThis allows me to quickly and easily get my clients key multi-channel performance metrics in one easy to digest report! Game changer for client communications and expectations. Also help in the sales process! We have so much less manual work to do; we save many hours a month that can instead be used for our customers! Saves a lot of time as I can pull data from various channels all within one platform! Customer service has been great, quick responses. The dashboard is awesome, looks good, and has everything we need to client reporting. Kudos! I like your system, but love the support. It feels that your team is very willing to work with us to accomplish what we need. Simple, easy, flexible, and versatile tool with a great UI. This tool has helped us close new accounts and improve customer satisfaction. DashThis provides us with the metrics we need as well as an easy way to automate our client reporting. Also, their customer support is great. We use so many different reporting platforms - this consolidates what we give our clients. DashThis is a phenomenal tool for communicating with clients and staff. With 10 minutes of set up, I can create a custom report for a client that speaks to their digital marketing goals. We used to spend 30-40 hrs on monthly reporting. We’re now down to 10-20 hours max while providing even more detailed information.